I found this in my inbox from Highlights and thought it was too cute and clever not to share. What a fun and easy festive craft that uses recycled materials. Wash out an empty milk carton--either a quart or half-gallon size will do. On a separate piece of paper, draw 4 rectangles--each the size of one side of your carton. On each rectangle draw the outside wall of a house by creating windows, door frames, bricks, and decorations. 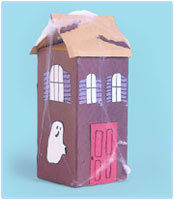 Cut out the 4 paper rectangles and glue them to the sides of the house. Glue on shutters and doors that open and shut. Add cotton cobwebs for atmosphere. Use another piece of paper to make a roof. Draw and cut out people, bats, ghosts, and spooky vehicles and add them to the house. This is a great group activity for a party or family. Each person decorates a house, as above. Put the houses together to make a "ghost town."